Okay. So it’s technically a white check in a blue badge. I’m going along with the majority and will call it The Little Blue Check. 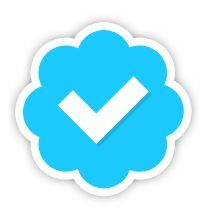 Have you ever wondered why some people with Twitter accounts have a little blue check next to their name while others are slighted? This icon is symbolic of becoming an up-and-comer or famous and can be awarded to those who have so many fans, fake accounts abound. According to Twitter, there are several stipulations. 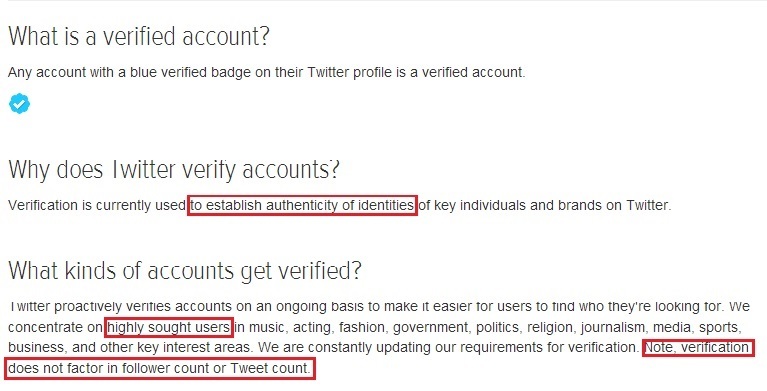 They verify accounts of “highly sought users.” The article states the number of followers OR tweets are NOT a factor. I’ve noticed many new authors who keep their “following” numbers low. My guess is they think if they follow back, they won’t look as fancy-like and won’t get The Little Blue Check. It doesn’t work that way guys and gals. I perused some of my own blue check followers. Chris Gore is a comedian, writer, and TV host who has 238,323 followers. He’s following 127,272 people. WOW! Mike Braiotta from NY Storage Wars follows me. He earned the blue check with 17,358 followers. 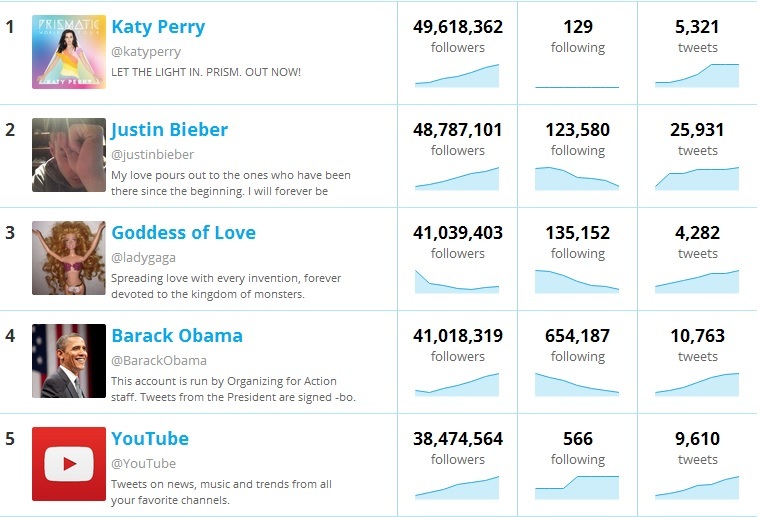 He is following 15,433. What a great guy! Mark Zwilling, author and tech guru, has over 720, 672 followers and is following 452,775. He is great about communicating with “the little people” like me. Best-selling author James Rollins has 41,671 followers and is following 17,890. He’s just as nice in person! Actor Zach Galligan has 7,108 followers and is following 2,439. He is very cool about connecting with fans on Twitter. @zwgman I am mentioning you in my next blog post! It's about "blue check" people and following others. You are the best at connecting! 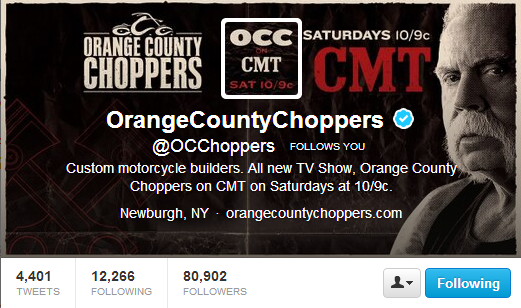 Orange County Choppers has 80,902 followers and is following 12,266. Vroom! I love Paul’s ‘stache. Brian Bushwood, of Discovery Channel and TwitTV fame, has 170,882 followers and is following 87,827. That is a lot. Marketing master Shaun Gordon has 61,778 followers and is following 38,013. Very cool. My most recent blue check follower is The Bloggess who has 365,791 followers and follows 24,288. She’s takin’ it downtown! I do not have a blue check, but at last peek, I have 5,133 followers and am following 5,028. What about the hundred I didn’t follow? They are “bots,” (automated tweets) or whackadoodles whose tweets I would rather not read. You don’t want the people you are following to race through your feed, you say? Ha. Twitter is waaaay ahead of you. Lists can be created with categories, so you can check out your faves at a very slow pace. Following fewer people has no bearing on the verification process. The number of people who search for you and read your tweets, does. So next time you hesitate to press the follow button, remember that number has nothing to do with it. In fact, your new friends could tweet you after your 2 minutes in the spotlight and could help you ascend to blue check fame! JR Moehringer, a Pulitzer Prize winning journalist, penned The Tender Bar and Sutton and collaborated with Andre Agassi to write Open. He is still waiting for his verification. 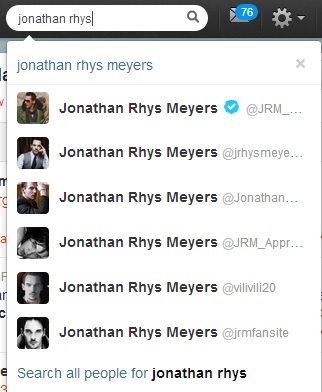 The more unusual your name, the less likely you’ll get a blue check unless fan sites with the same name appear. Andre Agassi is being followed by 187,279 and he is only following 283. C’mon Andre! You won’t lose your check if you follow me back. I promise. 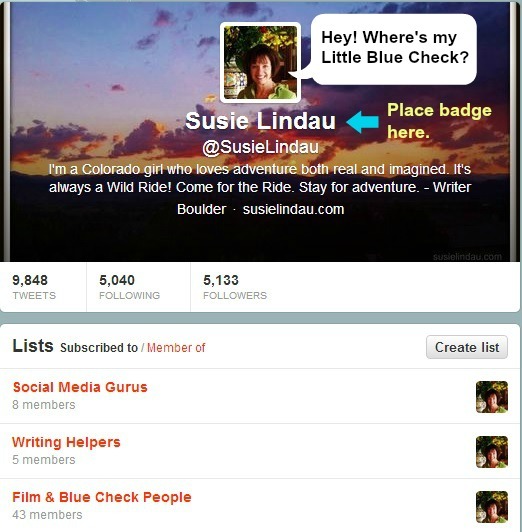 I am waiting for hundreds of Susie Lindau fan sites to crop up, so I can earn my Little Blue (white) Check. Okay. I’m not holding my breath. Leave your Twitter handle (name) with a comment and I’ll add you to my posse! There’s a little blue check? I really need to use Twitter more. I didn’t notice it even when I started following celebrities! 🙂 For being an artist, I’m not always very observant. Thanks for stopping by Miss Thoughtsy! If anyone deserves the little blue check, you do! I’m not sure it will enhance life in any way but hey … it’s always good to have a quest! How’s the skiing this winter? Hahaha! Thanks Pat! This year my goal is to get my book published! Sheesh! What a process. It’s gone through a big revision since you saw it. I have only been skiing twice even though the snow is “hideous!” I’m avoiding the crowds since my doctors warned me not to fall. That’s like going to a pool and being told to stay dry! How the skiing up there in Canada? It turns out I’m not following very many people that have been verified. I haven’t paid much attention to the “blue check” probably because I don’t see it that often. I’m not verified although I assure I am me. You should certainly be verified as you are know far and wide. Hahaha! Not really, but thank you! I started following blue checked comedians. Several of them tweet out hilarious jokes daily. Others interact with “regular” people. I didn’t notice the check for a while! Until now, I was unaware of the Twitter blue check. Unfortunately Twitter is and will remain an anathema to me. I’m like Jim(Ginger fightback) I don’t understand it and am reticent to do so. Here’s to staying Big C Free my friend. Thanks Talia! Great to “see” you! Twitter is a fun playground to romp around in once you know how it works. A lot of people just “blog whore” all day and never communicate with others. A total waste. I try to do a little “mingling” every day! I’ve met people from all parts of the world through it! these Blog whores, is any of their content worth reading? Thank you for sharing this vital, hard-hitting knowledge which would be even more vital and hard-hitting if I had any inkling of what is actually involved in Tweets and Twitters. I am such a Luddite. Well, I’ll be. I need to get out more because I never noticed the blue check. Hmm. I have just about the same amount of peeps following as those I follow. I have to admit that I let Twitter go for a while. A long while. But I have made it my goal to be a more active Twitterer! Though I don’t have much to say, I do like to RT. I’ll keep a look out for ya Susie. I am on Twitter, but can’t remember the last time I tweeted something meaningful other than that I just posted to my blog, lol. I have tried to be Twitterlicious but can’t seem to get it right. Guess I’ll never get my blue check. Durn. So now I understand how it works! You know we already follow each other. Maybe one day I’ll get that little blue check. Until then I’ll stay a blog whore for a while but I also use Triberr to help promote other blogs while also mingling a bit. I’m still a Twitter baby. You’re Blue in my book, Susie! I only follow those I intend to read. The result of that, I’m told, is that people periodically unfollow me because I haven’t followed them back. It’s a dumb world we live in where people only follow you in hopes you’ll follow them back. Rather shallow, nu?